Planning a weekend away soon but don't know where to go? That's exactly what I was thinking whilst planning a getaway for the May bank holiday. I knew I wanted to go on a city break but it had to be somewhere that was fresh and new to me - Waterford popped to mind. I remember going here as a child, but now in my mid twenties, I wouldn't know where to go or what to do - so it was a great chance to discover the city. Here's a breakdown of what I got up to whilst I was there, hopefully it can act as a rough guide for your next trip to Waterford. I was trawling through all the booking.com's and the like to find a great deal for the May bank holiday weekend, keep in mind I only booked this the week before! I stumbled across Treacys Hotel located on Merchants Quay. I knew I wanted a hotel that was within walking distance to the main streets, affordable and had a leisure centre. Treacys Hotel ticked all of the boxes. Upon arrival, I couldn't find any hotel parking. I had to park temporarily in the loading bay, so during check in, I asked the lovely staff where I could park. They gave me a print out of the location of the underground parking, it could be found about 3 streets away in a Lidl carpark nearby. It wasn't ideal when it was raining, but it did the job. The hotel itself was nice, the rooms were very simple and had everything you would need (hairdryer, Barry's tea and so on). The leisure centre was great, there were only about 6 other people there when I went - meaning you could enjoy the pool and the jacuzzi without stepping on peoples toes (literally!). For a budget hotel, I'd definitely recommend it. It's cheap, cheerful and only a stones throw away from the buzz of the city. For an average price of €75 per night per room, it's well worth a look. Something I hadn't known before visiting Waterford was the amazing street art and graffiti dotted around the city. After doing some research I found out that it's all part of Waterford Walls, 2017 will mark its third year running. This is an annual festival to help reinvigorate the walls of the city from the help of 50 street artists. You can watch the art being created live between the 17th - 20th August, I'm definitely going to head back to see this in action. As my friends all know, I'm slightly in love with vintage shopping. There's something about trawling through rails of second hand clothes and stumbling across a gem. Thankfully Waterford did not let me down on this front - I discovered The Vintage Factory located on Georges Street. After spotting a beautiful polka dot pussybow blouse in the window, I had to pop in. Waterford is known to be steeped in culture, specifically Vikings. As you walk around the city, you can see how proud the city is of its Viking history. I thought it'd be nice (my Dad recommended) to check out the Medieval Museum priced at only €7 per adult. I have to point out the building itself, it's stunning. Not only is it massive, but it has a curved facade with "Medieval Museum" engraved into the buttery coloured stone. Once inside, every turn you take is another Instagram shot. I opted for the guided tour from the headset with accompanied tablet, but I could have waited for a tour from one of the museums guides (a real person) if that's what you'd prefer. I learned so much about Waterford and it's history, and wow, is there history. From the fashion, to the life of the people, to the religions, and so much more. It had it all. On the walk into the city centre from the hotel that morning, I was already planning where to have dinner. I passed by many beautiful restaurants on my way into the city centre, but one stood out - Peppers Indian Restaurant. If there is one place you should eat at in Waterford, it's here. I'm going to put it out there - this was the best Indian food I've ever had. Yes, ever. Myself and my boyfriend got a whole booth to ourselves. The atmosphere was great and lively, but without being crowded or noisy. The food, from start to finish, I couldn't fault and the staff were excellent. I really couldn't recommend this place enough, I'm sure my family and friends know off by heart what I had to eat at this stage, that's how much I go on about it. A definite 5 stars from me. When venturing outside Waterford city itself, I really stumbled across some gems. I decided to venture around The Copper Coast, in particular Annestown Beach. The drive there was beautiful, even though my sat nav did get slightly confused as to where we were going! As I was driving around The Copper Coast, I pulled into the carpark of the first beach I came across, which happened to be Annestown Beach. This beach is exactly what I think of as a true Irish beach. Featuring stunning cliff walks and a beautiful sandy stretch of beach, what more could you ask for on a sunny day in Ireland. There were even stone steps that a few people were perched on, as they just looked at the stunning waves crash onto the sand. The beach had about 20-25 people on it in total, which made it all that bit more special. I walked up the cliff walk located on the right hand side of the beach, and the views from there were even more spectacular. I can't wait to go back. As I was driving to our next location, I spotted this amazing gnome shrine. Now, I love gnomes, so this was a real treat. I pulled over, and walked down the hill to take a picture of it. When I arrived, I spotted this lovely old lady who I honestly had the nicest chat with. She was gardening within this amazing blue and white wood carved boat, featuring the brightest flowers I had ever seen. She told me how she loves keeping busy and has been doing the gardening for the past 50 plus years, keep in mind she had just turned 83. We talked about Waterford, the difference of living in the city to the countryside and everything in between, it was just lovely. Then, she offered me to stay for tea if I was around that evening but unfortunately I had to drive back to Dublin. It just really touched my heart, things like that aren't offered within my generation anymore. I feel like we're scared, the media tells us strangers are dangerous. However, she brought the Irish culture back in true form, or in other words, by being lovely. Anyways, overall, this was the highlight of my trip. Just the pure openness and sweetness of this lady opened my eyes up to being friendly and how much of a difference it makes. So, thanks lady! I then headed on to Tramore. If you're after a seaside amusement park, this is the place to go. As soon as I got there I spotted a cafe selling churros, Pipers Cafe. Now. Churros are the most amazing spanish snack ever. If you haven't had them before, go get them right this moment. Plus, the churros at Pipers Cafe were stunning (and I'd like to think i'm quite the churros connoisseur) - they came with a sprinkling of icing sugar (it's ruined by caster sugar) and a healthy dash of Belgian milk chocolate. I was in heaven. From there, I took a walk around all of the amusements, from the beach to the arcades. It was fun. For food, I went to The Victoria House. Upon arrival it seems like a very quaint pub, but if you go upstairs to the restaurant you are greeted with spectacular views of the bay. I was lucky enough to be seated in the perfect spot at the window. I'm still thinking about the view to date. All in all, Waterford was great. The city itself has lots to offer and as soon as you venture outside of the city bounds, the choices are limitless. Would I go back? Yes. Hopefully you'll find a few things that sparked your fancy from my "What To Do In : Waterford". Until next time! Hi - I'm Clo. 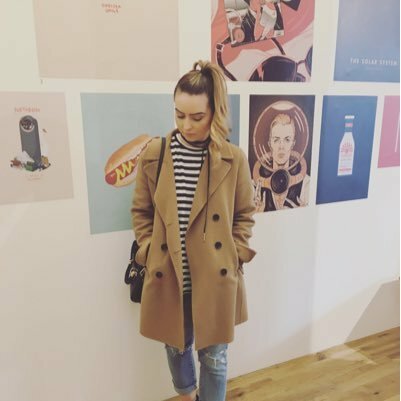 A twenty-something Dublin dweller with a love for all things fashion, beauty, lifestyle and music related.